What is Lipo Contrast ? It is a fat reduction device based on a Cryolysis advanced technology: thermal contrast lipolysis. 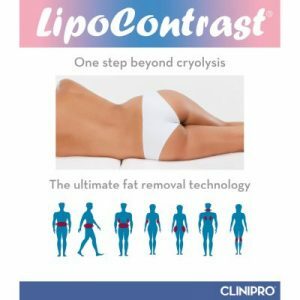 LipoContrast subjects fat cells to a triphasic thermal shock (initial heating – cooling – final heating) to remove fat, even fibrous one in just one session after few days. This unique device is able to treat smaller areas such as double chin and arm flanks. What are the areas of treatment ? we will recommend at least 3-5 sessions cycle with 4 weeks interval in between (one area).